A teaser is a small ad unit consisting of a title, an image, and a short text. Such an announcement usually contains only a part of the information about the product / service, without demonstrating all the advantages, but only intriguing a potential client, thereby stimulating the purchase / order. Then the management page will be opened Teasers. There are such ways to create ads. 1 Add teasers one by one. 1.1 Title of the teaser. 2 Bulk loading of teasers. Add teasers one by one. Allows you to load Teasers one by one. To add Teasers in this way you need to click on "Add Teaser" button (image 2). Then the creation page Teaser] (image 3). To create Teaser you must fill in all the fields and load the image. 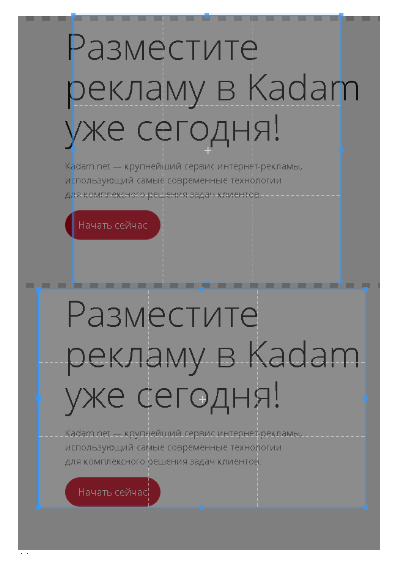 Maximum word length for fields "header Teaser "and" text "20 characters. The text that appears above the description Teaser on the webmaster's website. A meaningful header can significantly increase the CTR. Maximum 50 characters. The text to be displayed next to the image. Up to 70 characters. Link to go when clicking on Teaser. The domain specified in the campaign settings must match the Url Teaser. Image Advertising Formats # .D0.A2.D0.B8.D0.B7.D0.B5.D1.80.D0.BD.D1.8B.D0.B9_.D1.84.D0.BE.D1.80. D0.BC.D0.B0.D1.82. Teaser. Teaser can be both square and rectangular. After adding the image to the teaser, the advertiser will be asked to trim it to a square and rectangular view. The higher the resolution of the image, the more potential traffic can be obtained. The minimum size of the image loaded into the teaser is 500 by 500 pixels. Valid file extensions for teaser: jpg, png, jpeg, gif. Maximum image weight: 512.0 KB. After saving Teaser will be sent for moderation, in case of successful moderation and when this field is set, the status of advertising material will be “paused” and not “active”. Set bids for specific promotional material. By default, the bids specified in Campaign Settings are used. Displays a list of Keywords that have been added to the campaign settings. After all the fields are filled, you must click on the "Create" button (image 5). Or to "Save and add more" button (image 6). In case of correct filling of the form fields, Teaser will be saved and the form for adding a new material will open. Allows to upload all images Teasers one archive. To add Teasers in this way you need to click on the "Bulk load" button (image 7). After pressing the button, an additional window will open for downloading the archive with images (image 8). The contents of the archive must comply with the instructions of this window ( 'Note:' images when bulk loading should be only square, and the option to load rectangular images does not work when bulk loading through an archive file). After downloading the images, the creation page will open Teasers (image 9). After filling in all the required fields for each Teaser, you need to click on "Save" button. After that Teaser will be moderated. Campaign status must be "active". Restriction for the title - 30 characters. Text limit is 70 characters. The limit on the length of the word - 20 characters. Domain Teasers should match the target domain of the ad campaign. Option "Do not delete materials when checking RSS" - when this option is enabled, all previously downloaded materials remain in the campaign. 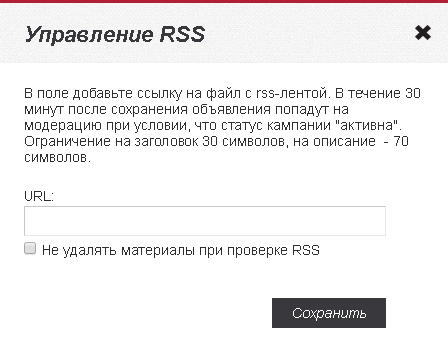 If the option is not selected, the material that is in the system, but it is not in the RSS will be removed from the system. After adding a link to the rss file of the tape, you must click on "Save" button. When successfully added Teasers will be moderated within 30 minutes. This page was last modified on 23 January 2019, at 14:57.